Is Bill Gates about to invest into Airborne Wind Energy? Bill Gates is well known to have a strong interest in renewable energy and solutions for climate change. 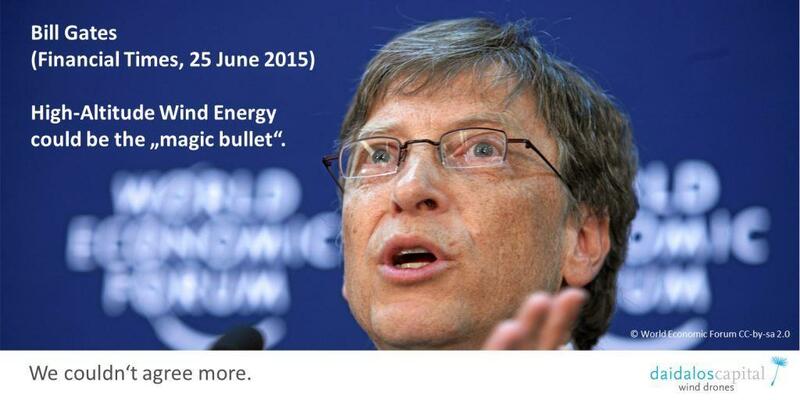 It is not a big surprise then that Bill Gates is monitoring Airborne Wind Energy closely. Bill Gates discussed Airborne Wind Energy in his blog as early as 2010 with Stanford scientist, Airborne Wind Energy advocate and co-author of the High-Altitude Wind Atlas, Ken Caldeira. They rightly observed that the Airborne Wind Energy industry was in its infancy back then. But technologies and companies have advanced dramatically since and Bill Gates has taken notice. In 2015 Bill Cates called for “Energy Miracles”. With miracles he meant new technologies that can help solar photovoltaics and conventional wind turbines in achieving a quicker and more affordable transfer to 100% renewable energy. He is especially looking for technologies that can solve the problem of intermittency of renewable energy sources. When asked to name such potential breakthrough or “miracle” technologies, Bill Gates mentioned High-Altitude Wind Energy and called it a “potential magic solution” for the world’s energy problem. In a different interview he called High-Altitude Wind Energy one of the three most promising technologies for renewable energy generation. Bill Gates may act on his positive view and become an investor in the technology. In 2016, he set up the Breakthrough Energy Coalition and Venture Fund together with some fellow billionaires to invest in technologies and companies that can create “Energy Miracles”. The fund has a volume of over USD 1 billion. And it has taken Airborne Wind Energy into its investment focus. The fund homepage states: “the development of transformational new ultra-low cost wind power technologies will be required […] to unlock the vast wind resources that exist at higher altitudes […]”. The fund has yet to announce its first investment. But after all of the above, it should surprise nobody if the club of investors in Airborne Wind Energy could soon welcome Bill Gates as its member. With Shell and E.ON, the world’s largest public oil and gas company and the world’s largest public utility already being members, the world’s richest person, Bill Gates, certainly looks like a good fit.